Map 43, runs via Bruthen + Now Nowa to Orbost. This is a scenic discovery ride through rich farmlands, rolling hills, forests with river and Gippsland lakes views. How to plan your route into work along the bike paths and on-road lanes. Index map to the Rail Trails and country town rides. 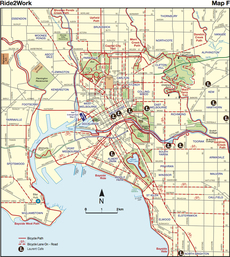 Index map of cafe's along Melbourne's bicycle trails. Perfect for that invigorating coffee. 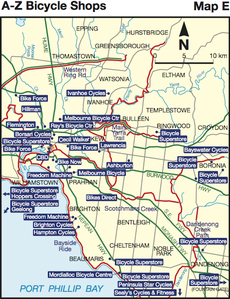 Location map of major Melbourne Metro Bike Shops where you can purchase the latest Bikepaths Guide and of course get great service. Detail map showing the bikepaths around the Williamstown historical precinct including the Timball Tower. The first leg of Australia's most popular 39 km long Upper Yarra Valley rail trail that takes in Mt Evleyn, Wandin and Seville complete with a great host of wineries, cafes and historic stops enroute. The second leg of Australia's most popular 39 km long Upper Yarra Valley rail trail that takes in Launching Place, Yarra Junction and Milgrove complete with a great host of wineries, cafes, a saw mill and historic stops enroute and plenty of pubs and accommodation as well. Boasting historic towns, wineries mountain air and unsurpassed scenery Victoria's High Country lays claim to being Australia's bike touring Mecca! Just type in your search and Bikepaths will automatically do the rest.